As a human behavior hacker, Vanessa Van Edwards created a research lab to study the hidden forces that drive us. And she’s cracked the code. In Captivate, she shares shortcuts, systems, and secrets for taking charge of your interactions at work, at home, and in any social situation. These aren’t the people skills you learned in school. 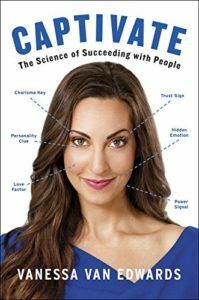 This is the first comprehensive, science-backed, real-life manual on how to captivate anyone—and a completely new approach to building connections. No matter how many behavior hacks you learn, if you go to events that make you unhappy, it will be incredibly difficult to increase your memorability. When you feel great, other people pick up on it and want in on it. When you drag yourself to an event because you feel like you “should make an appearance,” you are the party pooper. And you smell up the event. We noticed that the people who collected the least amount of business cards tried to pounce on people right in the Start Zone. What they didn’t realize was that they were trying to connect with people who weren’t open to connection yet. When you approach someone before they get oriented to an event, they are not only more distracted during your conversation, but they will also be looking over your head to scope out the room and find people they know—you’ll have a much harder time engaging in eye contact. They are also more likely to excuse themselves to get their drink, grab some food, say hi to the host, or go to the bathroom—and less likely to be receptive to anything you have to say. The best thing to do is wave or give your friends a quick hug when you arrive, and then say you will circle back to them. The Social Zone is where the magic happens. First, the best place to start working a room is right where people exit the bar. By the time they’re here, the emotional, high-anxiety feeling of the Start Zone will have died down. While I don’t recommend standing around the food, hidden sweet spots are at the couches or bar tables where people are already eating. They are often hoping for someone like you to set their plate down beside theirs. Something like, “Hey, can I join you while you eat?” works well. Bonus: If you are an introvert and don’t like big groups, I highly recommend being what I call a Grazer. Instead of hitting the buffet once for a heaping plate, go up first for appetizers, again for the main course, and then again for seconds or dessert. Why? This is an easy way to take a break from a conversation or move to a new one-on-one. We decide if we believe someone, if we like someone, and if we trust someone before we have even heard him or her speak. With a first impression, you are a Triple Threat when you use your hands, your posture, and your eye contact. Never, ever skip a handshake. Don’t replace it with a wave or a high five or—heaven forbid—a fist bump. Why? The moment we have skin-to-skin touch with someone, our body produces something called oxytocin. Winners typically take up as much space as physically possible. Frequently called “Power Posing” this is when we raise our arms over our head, expand our chest, and tilt our head up. Why is eye contact so powerful? It produces oxytocin, the chemical foundation for trust. When you produce dopamine during a conversation, you not only give your partner more enjoyment, you are also assigned more significance, which increases your memorability. You mentioned that you volunteer with Big Brothers—have you always done that? You asked for Argentinian wine—are you a wine aficionado? I noticed that your purse is handwoven—did you make it? I was curious about your accent—are you from here? I was just looking at your bookshelf—you have great taste in reading materials! Your name is beautiful—is it a family name? I saw you posted some great pictures of your new dog on Facebook—what made you decide to get a dog? Put a unique quote in your e-mail signature. Noah Kagan, creator of an e-mail and analytics software, has a funny sign-off on all of his e-mails: “Ps. Y u NO install the free SumoMe.com to get more e-mail subscribers?” The purposeful misspellings and play on a popular meme make his ask unique and very clickable. Not good with names? Not anymore. Here is my three-step Name Game that you can do every time you meet someone new: Meet and Repeat: As soon as you hear the name, say it out loud back to them. “It’s so nice to meet you, Eliza!” or “Eliza, this is my colleague Jenna.” This jangles the audio part of your memory and allows you to hear the name in your own voice. Plus, you give them a nice hit of dopamine. Spell It Out: Now we want to give that name a visual hook. Memory expert Dr. Gary Small encourages people to mentally spell out the name they are trying to remember.9 You can also pull up a picture of the name in your head. Associate and Anchor: Lastly, tie the name to someone else you know with that same name. It can even be a celebrity. This anchors the name to someone else you are familiar with. For example, whenever I meet a Matt, I always seat him at a poker table with all of my other Matt friends. Bonus: If it is a unique name or a name you have not heard before, tie it to a word that most closely resembles it. For example, I met a Syder (pronounced very similar to “cider”) so I pulled up a mental picture of a steaming glass of cider. He was shocked when I remembered his name at the end of the night.